Here is a training environment that I am almost done building on my laptop. I am running Windows 7 x64 with 8GB RAM and VMware Workstation 7. 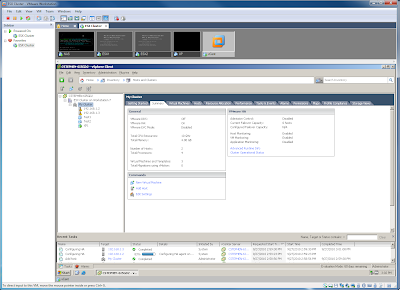 In the past I always put the vCenter box on the ESX hosts however 4.1 requires a 64 bit OS and that is not possible yet in a nested virtual environment. Up next DRS needs configured and I will have a ready to roll ESX Cluster.